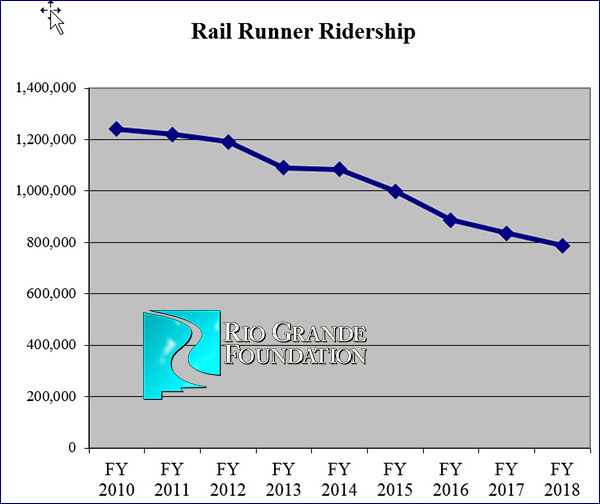 With renewal of a gross receipts tax on the ballot in several northern New Mexico counties (Los Alamos, Rio Arriba, Santa Fe and Taos) to fund the Rail Runner and related services, the Rio Grande Foundation requested updated annual ridership information. After years of decline and despite an improving New Mexico economy, ridership on the train again declined dramatically between FY 2017 and FY 2018. In FY 2017 835,561 rode the Rail Runner while that number dropped to 787,116 by FY 2018. That’s a decline of 5.8%. Since FY 2010 ridership on the Rail Runner has dropped an astonishing 36.55%. Earlier this year the Rail Runner received $30 million from the federal government to implement “positive train control.” The train receives tens-of-millions of dollars in direct and indirect taxpayer subsidies annually. Is there any correlation between Rail Runner ridership and state government workforce levels in Santa Fe? The train schedule clearly is tailored to commuters with time on their hands, rather than tourists or business visitors, and it’s likely that state employees make up a significant share of ridership. The Dems have been complaining about Gov. Martinez’ cutbacks and widespread job vacancies in state government, and this could account for the drop in commuting. This suggests that the likely combination of a Dem governor and state budget surplus could increase RR ridership. Whether taxpayers should support a train used primarily by government employees is another question, of course. I did some figures and I need some clarification. If the State got $30 million and we lose $20 million a year on the train; And the ridership is 2156 people a day that come down to this: Each time someone gets on the train it costs a taxpayer $63. Is that anywhere near the correct amount? If it is, that is crazy.